Another big update - wow, we have been busy! Firstly - thank you all who have sent kind & worried messages to us about the hurricane! Please don't worry, we are fine, we live very near Orlando in Central Florida, Irma should be only a tropical storm (or less than a hurricane) by the time she arrives here. We've been through Cat 4s before in our fortress of a house and have never had problems, we are all set. Probably just a bunch of rain here. That being said, just to be on the safe side, Disney has unfortunately canceled my WonderGround Co-Op tomorrow night (wind & rain of any sort aren't good for art shows!). They have however scheduled me for three more new events at Disney Springs - mark your calendars - November 11 (4-7pm at the Co-Op), December 9 (6-9pm at the Pop Gallery), December 16 (4-7 at the Co-Op). I'll add them to my official events page here SOON. The Kansas City Renaissance Festival is in full swing and my shop is open every weekend, #251 over by the Joust! I'll be there in person for sure on September 30, October 1, October 7, October 8 if you'd like autographs. Thank you all who came to see us at DragonCon and made it our best DragonCon ever!! Were you not able to come but still want to score some for the FREE DragonCon swag? We snagged a ton of the extra DC Room Key Cards I designed (and autographed), set aside 8 of the DC Strangeling reusable giant plastic carrier bags, and have half a dozen each of the backups of the DragonCon Exclusive Pins! No, I will not sell these, but I will be giving them away as prizes randomly to my Patreon Patrons sometime next week! Sign up for Patreon here to get in on the giveaways next week, we'll have dozens of winners! 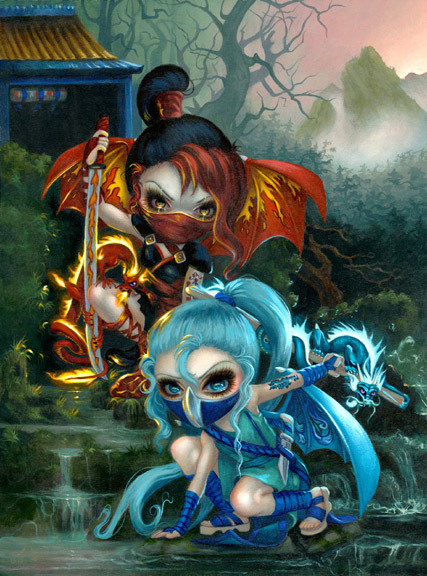 One of my new paintings that debuted at DragonCon was "Ninja Dragonlings!" The original sold at the show but we now have prints & canvases on sale this week on my website here. Big announcement - September is Faces of Faery Fan Month! All 240 Faces of Faery prints (including all canvases) here at my website are 25% off with code FOF25 . We'll also be doing fun things like auctioning off your own custom Faces of Faery later this month, releasing some classic #1s that have been in the vault, and showing off some brand new original FOFs! Would you like your Mermaids Coloring book a couple months before everybody else, no matter where you live? Would you also like it autographed? Well, we are getting a limited number of advance author copies that will be IN STOCK IN OCTOBER and I can autograph them for you! We have them up for pre-order on my website here, we ship worldwide (we can't offer the low prices Amazon can, lol, but hey - they're autographed!). All the bookstores are saying "Mid December" for shipping, and theirs won't be autographed, so this is kinda neat for you earlybirds! And finally - Brushdance has just released my 2018 Calendar! The Strangeling 2018 Calendar is available worldwide! There is a wall calendar (12 pictures, full sized) and a weekly planner (just artwork on the cover). 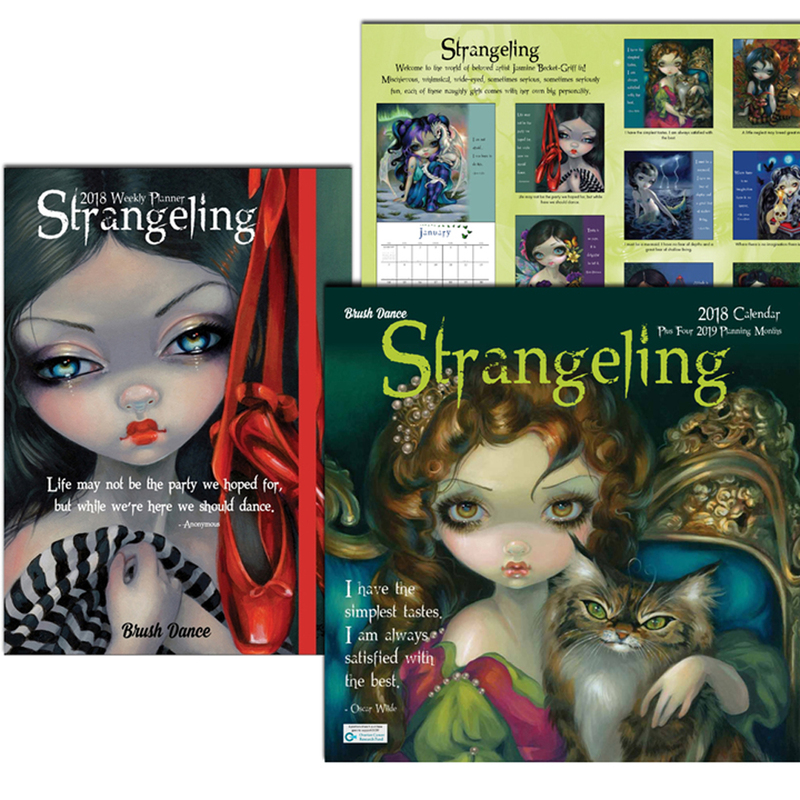 Just go to Google and search: Strangeling 2018 Calendar (don't call it the Jasmine Becket-Griffith Calendar as some bookstores don't bother with my long windy name). Or click for - Amazon, or AmazonUK , BookDepository (free delivery worldwide! ), Calendars.com , Brushdance.com - all sorts of places have it in stock now. I love this one! The original painting was sold at DragonCon (it appeared on the hotel key cards this year! I have some of the extra key cards too, we'll be giving those away over at my Patreon!). You may recognize these from my Hamilton Collection figurine designs from many years back - Izumi the Water Ninja, and Yuriko the Fire Ninja! 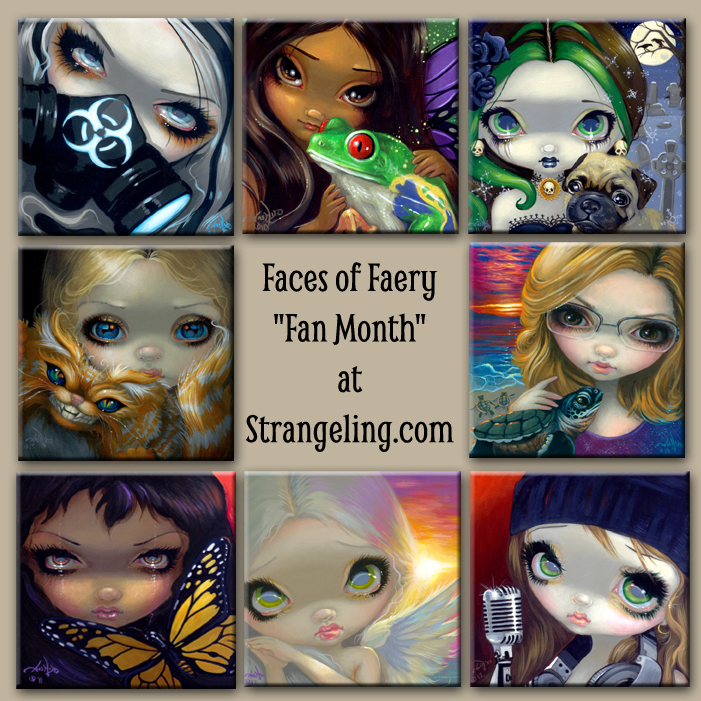 Faces of Faery Fan Month! Yes, all 240 of them! All are beautiful little square paintings, great for groupings or fitting in small spaces, I adore them. The Faces of Faery is a series of hundreds of paintings I've been working on over the past decade or so, each featuring a variety of types of characters all with fantastical elements of faery to one extent of another. And again, during checkout enter code FOF25 and you'll get 25% off all Faces of Faery. We'll also be doing some other fun FOF related stuff all month - new Faces of Faery originals, an auction for a custom Faces of Faery painting, releasing the #1s of some old favourites that have been hanging out in my art closet, lol, and more!. Here's a sneak preview - this will be out October 2nd and my stepsister Sonya helpfully colored one in partially to give us all a sneak peek! Just for my Patreon patrons, we are adding a new perk. Those of you in the $5+ tier will now get Patreon Exclusive Coloring Pages of my artwork, just for you guys! These will be completely different pictures not found in any coloring books, we're doing them JUST for Patreon. First page coming out September 12 - it will be "Bumblebee Dragonling", then October 2nd we'll have "Milagros: La Calavera." This is not a new tier, it's just an added perk on top of all the other stuff the $5+ members already get! If you are already $5+ you will automatically get to download the new coloring pages as they pop up. If you are not yet, you can upgrade your pledge or if you are brand new just click the "Become a Patron" button on Patreon here. The pages will be downloadable - we are definitely doing one new one each month (if this goes well we'll start doing them more often). They are exclusive to Patreon members and their households, the downloadable image can be downloaded and printed as much as you like for yourself & your own household (but not re-distributed elsewhere without written permission). You probably hear a lot of us talking about Patreon - it is a ton of fun and you get a lot of great perks & free stuff, behind-the-scenes info, advance previews, discounts, free original painting giveaways, there's a Patreon Pin Collector Club and more - check it out here. 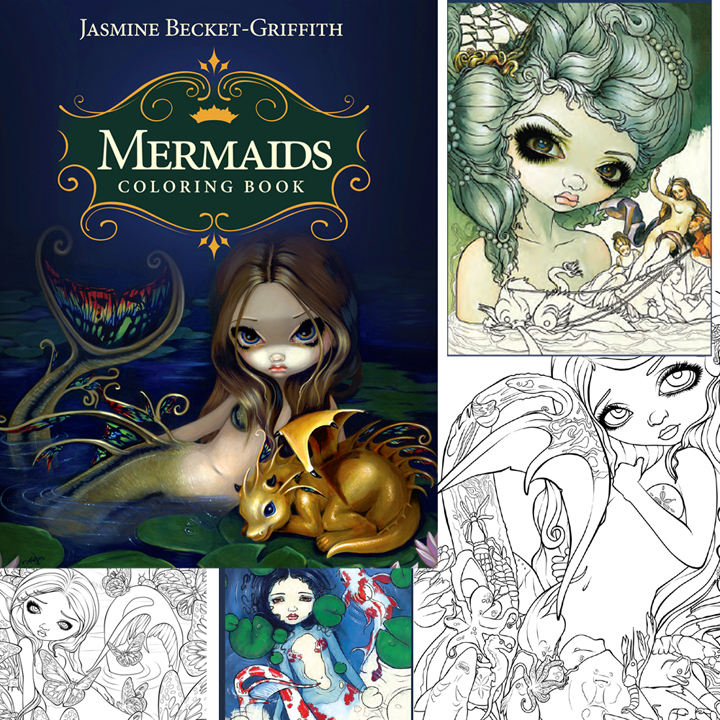 Early Autographed Mermaids Coloring Books! Want a signed copy and want your book months early? Worldwide? Autographed copies, worldwide shipping - Pre-Order for October NOW here we have officially been assured that we'll have a handful (around 150-200) author advance copies of the Mermaids Coloring Book in MID-OCTOBER for me to autograph and sell on my website here! We ship anywhere in the world! NOTE: You can also pre-order at all the Amazons, BookDepository, Llewellyn, BlueAngelOnline, etc. for mid-December shipping (according to their websites), but those will not be autographed (but are cheaper of course). Obviously since I have to first mail them to myself from Australia to autograph and then mail to our shipping center in Kansas, lol, those costs jack up the price of what I have to charge on my own site, so that is why they cost more from me than from Amazon or other booksellers (also my wholesale cost is astronomical compared to what the big companies get, even as the artist). Shipping too is more expensive, as we just have a regular personal shipping account (unlike Amazon, etc.) - we cannot control this. We charge exactly what the post office charges us, not a penny more. But hey - mine will be signed by the artist (me!) and will arrive months earlier! Also too - if you are in Florida in December- December 9th we'll be having a Mermaids event at Pop Gallery at Disney Springs - we'll have the coloring books there and I can autograph those for ya too, and in person! Details about that event are here. Brushdance has just released my 2018 Calendar! The Strangeling 2018 Calendar is available worldwide! There is a wall calendar (12 pictures, full sized) and a weekly planner (just artwork on the cover). 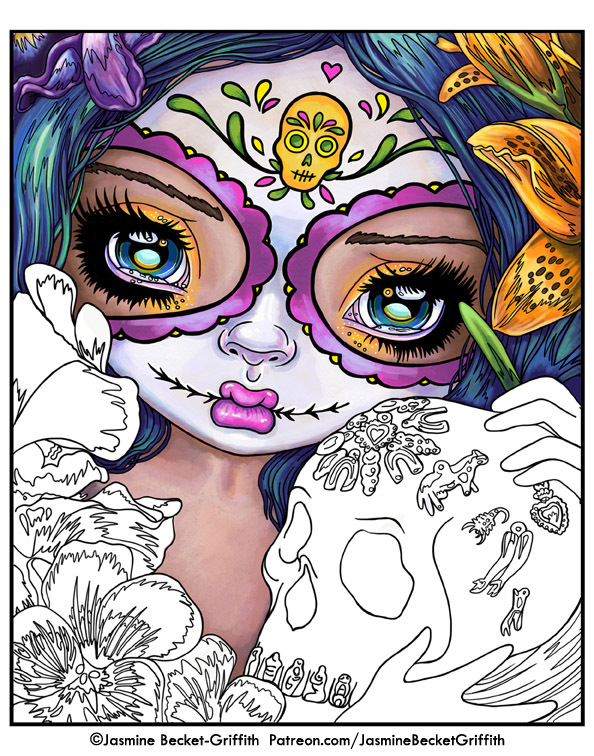 Just go to Google and search: Strangeling 2018 Calendar (don't call it the Jasmine Becket-Griffith Calendar as some bookstores don't bother with my long windy name). Or click for - Amazon, or AmazonUK , BookDepository (free delivery worldwide! ), Calendars.com , Brushdance.com - all sorts of places have it in stock now.